One of the best ways to use summer vegetables is to make a quick soup. If you want to add some bite to the medley of vegetables, noodles lend perfect balance to the dish. Ever since I visited Japan, I’ve wanted to try a dish at home using Udon noodles. They are thick wheat flour noodles which are best served in soups or broths. They are soft and sturdy at the same time which make them perfect ingredients for a wholesome meal. They leave you feeling full but not stuffed and veggies provide the required nourishment. 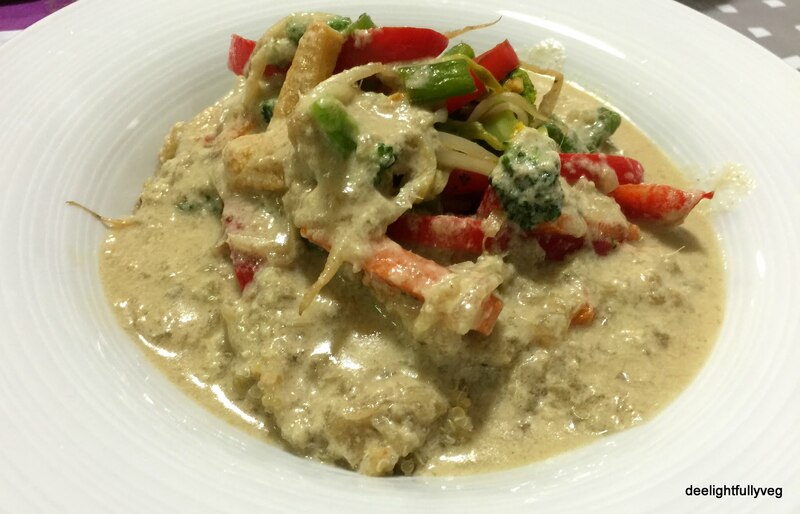 For a Thai twist, we add kaffir lime leaves to provide so much flavour to this dish that you would not mind just sipping the warm soup. Cook the Udon noodles according to the instructions on the packet. Do not cook them all the way – take them out when they are slightly underdone. Soak the lime leaves in some hot water. If you’re using veg stock, supplement it with this liquid. Place a pan over a medium-high flame. Add oil and wait till it just starts to shimmer. Add the onions and saute them till they turn translucent. Add the beans, corn, and carrot and saute them for ~30 seconds. Once you see a little colour on the veggies, add in the broccoli and bell peppers. Toss to combine. When the veggies are par-cooked, add in 1 cup of water / veg stock and the water from the soaked lime leaves. Cover and cook till the vegetables are just tender. Turn off the flame, add the udon noodles and let the soup steep for a few minutes. Do not overcook the noodles. If you are worried about overcooking them, put them in an ice bath once they are cooked. You can change the veggies used to suit your taste. Add the veggies that take longer to cook first. Do not overcook them. For a hit of spice, add some chili oil on the top. Rinse the quinoa at least for 4-5 times and then cook nicely till they fluff up – this should approximately take 20 mins. In a mixer, add the kaffir lime leaves, galangal, chillis and blend it till fine. In a pan, take 1 tsp oil and add the finely chopped onion. Saute it till light golden brown. Now add the blended galangal, chilli, and lime leaves to the onions and mix well. Saute this for around 4 mins. After this, add the coconut milk, vegetable stock, soy sauce and salt and mix well. Let come to a low boil and then simmer on low flame. Switch off after 7-10 mins. 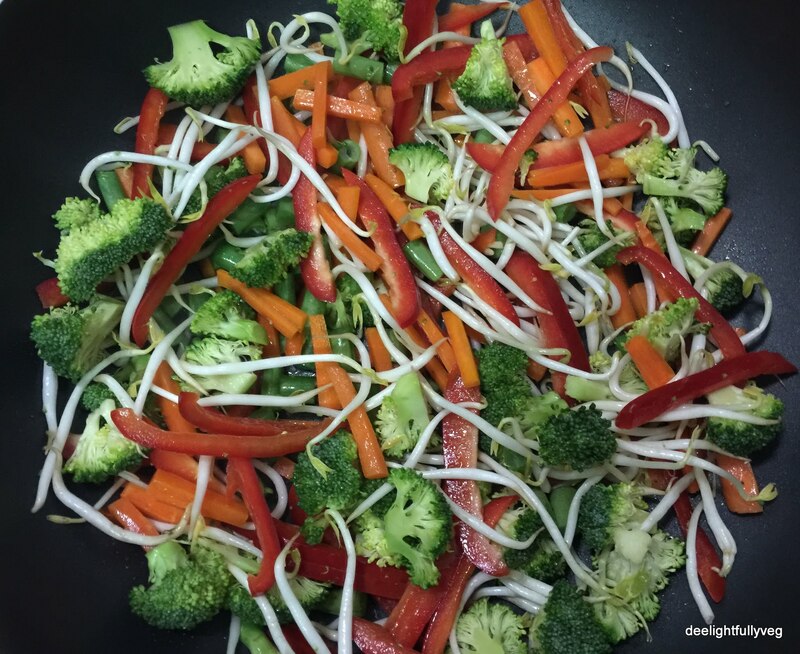 Simultaneously take a separate pan, add 1 tsp of oil and saute / stir fry the cut veggies. Use only half of the bean sprouts at this stage. This should take around 7-8 mins. Now the important thing is to assemble the broth bowls. 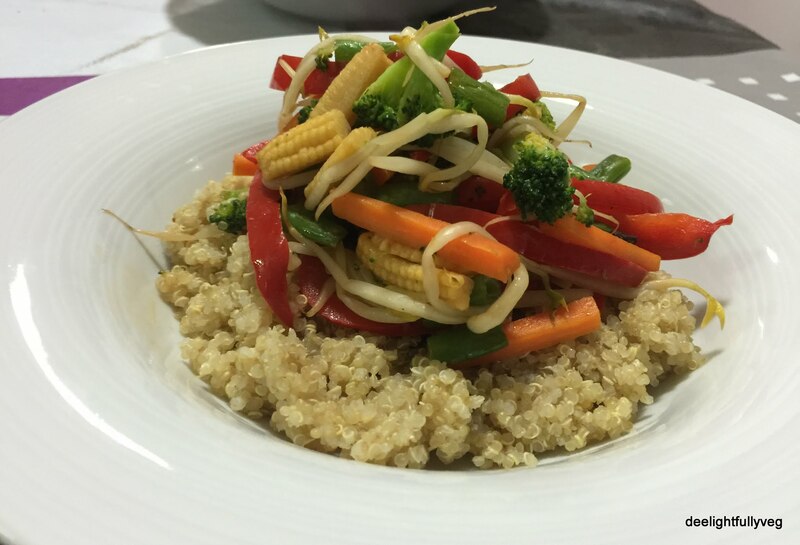 Layer the quinoa at the bottom and place the stir-fried veggies on the top. Finally add in the broth so that all the veggies soak in the aromatic Thai flavours. And then top it off with the remaining beansprouts as garnish. Eat this dish when it is hot. You may need to strain the galangal, chilli, and lime leaves paste if the galangal is old and fibrous. Do not overcook the veggies. They need to have some crunch. Reduce the salt added if you are planning to use soy sauce.